· William Merric (born 1888 and known as Merric) establishing the pottery at Murrumbeena. His children with his wife Doris all became artists, Lucy, Arthur, Guy, David and Mary. 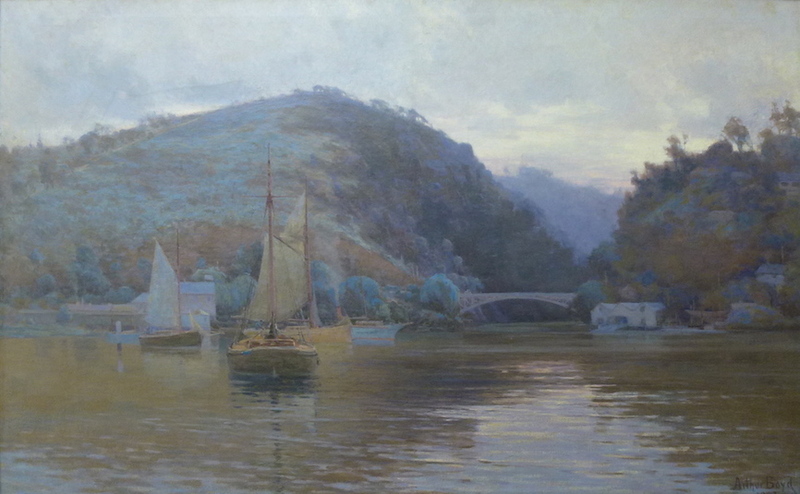 · Theodore Penleigh (born 1890) recognised as one of Australia’s finest landscape painters. He married Edith Susan Anderson in 1912 and they had two sons, with Robin Boyd the renown architect. Arthur Merric Boyd exhibited at the Royal Academy London in 1891 and his work was included in the Exhibition of Australian Art at the Grafton Galleries London in 1894 and he regularly exhibited with the Victorian Artists’ Society. He painted in oils and watercolour and often captured the Australian landscape en plein air. Summers were often spent in Tasmania where the scenery inspired Boyd’s art. This impressive large- scale painting captures a peaceful holiday calm. Cataract Gorge is a spectacular natural area where the South Esk River falls over the rocks in a gully between high reaching perpendicular rocks. A track around the Gorge was established in the 1890s and the graceful Kings Bridge was floated into place in 1867 and was the only bridge leading north out of the city for nearly 100 years.